From its inception, the UID project has been about creating the ‘database resident’. The website of theDepartment of Information Technology, which has been renamed as Department of Electronics andInformation Technology, modestly carrying the acronym DeitY, has said all along that “Project UID, aPlanning Commission initiative, proposes to create a central database of residents, initially of those above the age of 18 years”. Except, that the UIDAI got more ambitious and wanted everyone, from the newborn to the oldest resident, on its database. And it was always intended to converge variousdatabases to construct a profile of the individual, and to this effect the website of DeitY says that “the project envisages provision of linking of existing databases, as well as providing for future additions, by the user agencies”. 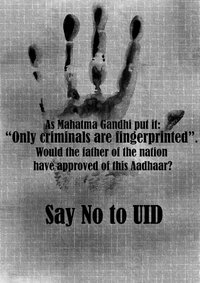 The MoUs between the UIDAI and various registrars that include the state governments, oil companies, banks and the Registrar-General of India, who is in charge of census and the National Population Register and socio-economic and caste census, not only provide for various additional fields of data being collected during enrolment, but also for having the UID number appended to each such database.